The SB-100P Series is designed for maximum efficiency and versatility. This series is a line of very affordable, super-high intensity "workhorses" for MPI and FPI inspections. Both models come with a special heat-resistant, 3-wire secondary cord. The primary and secondary cords are both 8 feet (2.4 M) long. 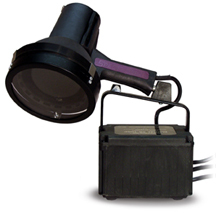 Lamps are also available with extended length primary or secondary cords, or with a 35 foot (10.7 m) secondary cord housed in a retractable "flying" reel.